Of Note: The National Museum of African American History & Culture has opened in Washington DC. Poets Entries are now being accepted for the New Criterion’s Poetry Prize of $3,000 and publication by St. Augustine’s Press. The prize is given annually for a poetry collection that pays close attention to form. Erica Dawson, Roger Kimball, and David Yezzi will judge. Submit a manuscript of up to 60 pages with a $25 entry fee byVisit the website for complete guidelines. Learn more. Artist Business Grants MASS MoCA’s Assets for Artists program is seeking Boston-based applicants for its Matched Savings Program, which supports creative entrepreneurs with a matching grant and artist-focused business and financial training. Eligible applicants must have a home or studio address in the City of Boston. Learn more. Poets, Fiction Writers Entries are currently being accepted for the University of Massachusetts Press Juniper Prizes. Four prizes of $1,000 each and publication by University of Massachusetts Press are given annually for a first poetry collection, a poetry collection, a short story collection, and a novel or novella. Learn more. Short Fiction Entries are now being accepted for the University of Iowa Press Short Fiction Awards. Two awards of publication by University of Iowa Press are given annually for first collections of short fiction. Writers who have not published a book of fiction are eligible. Learn more. MCC Artist Fellowships The Massachusetts Cultural Council is currently accepting Artist Fellowship applications for Crafts, Dramatic Writing, and Sculpture/Installation/New Genres. Artist Fellowships are unrestricted, anonymously judged grants for Massachusetts artists in recognition of artistic excellence. Fellowship awards are currently $12,000. Finalist awards are $1,000. Learn more. STARS Residencies The Massachusetts Cultural Council’s STARS Residencies Program (Students and Teachers Working with Artists, Scientists, and Scholars) provides grants of $500-$5,000 to schools to support creative learning residencies of three days or more in the arts, sciences, and humanities. Learn more. Videos, Animations, Computer Generated Work Proposals for the next round of Art on the Marquee are currently being accepted. Looking for work 30 second videos, animations or computer generated work, that use the entire Marquee in creative ways. Please submit a storyboard, statement, work samples, and CV to info@bostoncyberarts.org The call is limited to artists who live anywhere in the state of Massachusetts. Learn more. Boston Choreographers The Boston Foundation and The Aliad Fund have announced Next Steps for Boston Dance, a new grant program that provides multi-layered support for Boston-area choreographers creating original work in any genre. Offers 250 hours of rehearsal space; 6-10 consultations with experts in chosen areas of need/interest; $5,000 in implementation funds for the artist to take a “next step” in his/her work or career; a series of cohort meetings to connect choreographers, build relationships, and allow for co-learning. A minimum of three grants will be awarded in this pilot round/first year of Next Steps. Learn more. Ten-minute Plays Submissions of ten-minute plays by New England playwrights are now being accepted for the Boston Theater Marathon XIX to be held May 14, 2017, at the Stanford Calderwood Pavilion at the Boston Center for the Arts. Learn more. Writing Conference Scholarships If you’re interested in attending Muse and the Marketplace, GrubStreet’s national conference for writers, in Boston Spring 2017 but could use financial support, GrubStreet is offering numerous $250 scholarships for attendees. Learn more. Image credit: Circa 1940s: “Miss America.” (Joe Schwartz). 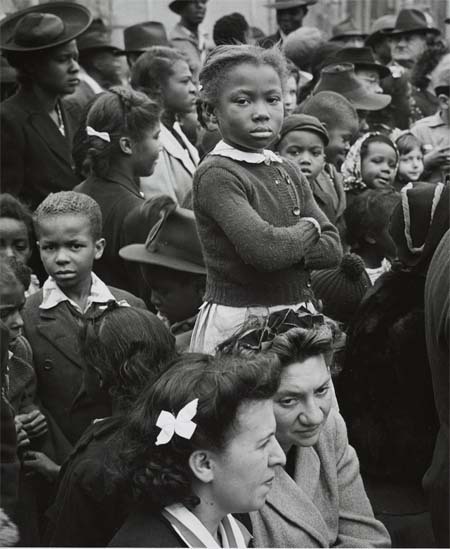 From the photography collection of the National Museum of African American History and Culture.